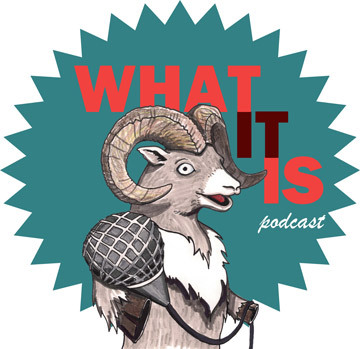 What It Is celebrates the holiday season with an annual tradition of trying not to promote the arts for once. Taylor, Brian, Mari and CTT welcome the hilarious Rebecca Merkley and the delightful sounds of Success 5000 for a discussion about projects, dog grooming and the year of the dumpster fire – 2016. Taylor attempts to get into the holiday spirit but generally avoids the topic as Mari aims to get him into the spirit of the season. The gang plays an intense game of Artist’s Checklist, CTT tries to look on the bright side, Success 5000 shares two songs and leads everyone in a rousing rendition of a holiday classic. Grab a festive beverage, hide from your family and toss the ep into your holiday ear holes!